Saturday 28th June 2014: It's not often you get to see great rock bands performing all day in Clapham, and a rainy Clapham at that. But through the rain tinted clouds, the Calling Festival crowd were treated to some fine music indeed even before the headliners came on, from Thunder followed by Joe Bonamassa. 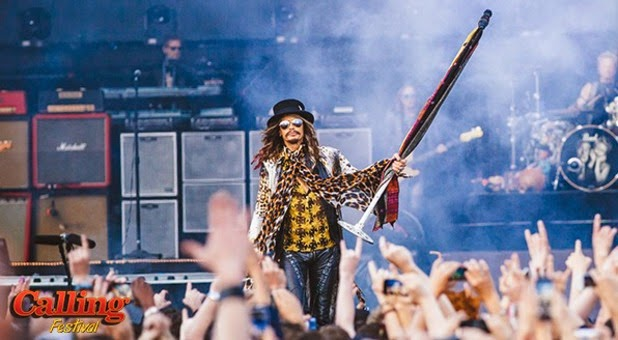 As part of their World Tour, Aerosmith rocked Clapham Common and boy don't we know it. Entering the stage with his mic stand slung over his shoulder, frontman Steven Tyler opened with Mama Kin followed by Eat the Rich and Love in an Elevator. With many a hit to their flamboyant belts, the crowd pleasing songs kept on coming - Cryin', Livin' on the Edge, I Don't Want to Miss a Thing, Dude (Looks Like a Lady) and Walk This Way were again all going down well with the audience... they even threw in a cover of The Beatles' Come Together for an added rock measure. Steven Tyler is a very good showman indeed, he has a good rapport with the crowd, and shows off his harmonica playing skills too. During the track Same Old Song and Dance, he even went down to the front of the crowd to sing amongst the fans! Closing the night with Dream On and Sweet Emotion, Aerosmith still proved that after forty years on from forming, they still have what it takes to blues-rock the place out. A fine end to the first day of this years Calling Festival.